Still got a long weekend hangover? Treat yourself to a pampering sesh with your friends at this beachy little nook in the heart of the city. So you got to refresh and recharge over the four-day long weekend. Good. But, if it somehow still felt bitin, you can make a quick getaway to a cozy day spa and indulge in a luxurious mani-pedi, coupled with a seaside-inspired full-body massage. If you're wondering where to get both things in one place, and if you happen to live near the Manila and Quezon City area, you're in luck: there's a newly opened pampering haven there, The Nail Fairy Day Spa, that offers nail services and body treatments in a beach house-inspired setting. Check it out this weekend. The Nail Fairy Day Spa is located at 126-B Speaker Perez St. Brgy. Maharlika, Quezon City (near Starbucks N.S. Amoranto, formerly Retiro St.). Book an appointment through 02-806-1078 or 0922-5888742. You're looking for an instant pick-me-upper that will fit into your packed sched. You're in desperate need of some well-deserved me time. You want to just chill and reminisce your last beach trip. You need to steal your best girlfriends away from their relationship/school/work worries for an afternoon escape--and pamper yourselves silly. You'll love the day spa's very relaxed, beachy vibe, with its white and blue interiors, seashell accents, beach glass, and pretty tile-mosaics. There are three different massage areas: two for solo services, and one couple room at the back. The nail services area features lazy boy-like chairs that adjust to your every move, giving you utmost comfort. You can definitely fall asleep in those chairs while the attendants work their magic. Start off with a classic hand (P220) or foot spa (P250), or get both for P470. Each includes a five minute soak with hand/foot blush, followed by a five-minute massage. Then, they'll apply a mask and wrap your hands/feet in a towel, to seal in moisture. 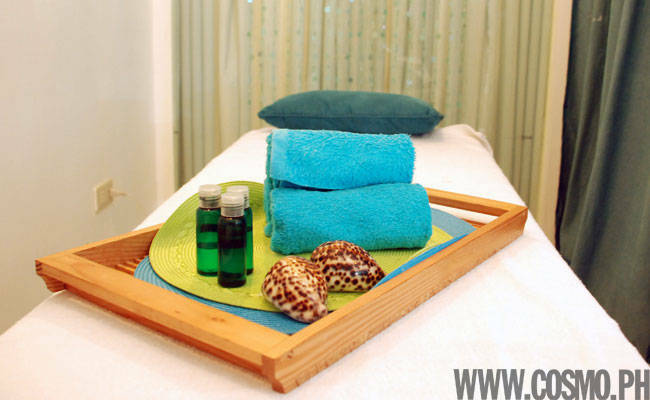 If you want to try something new, request for an additional 15-minute Fairy Shells massage (P100), which involves pressing heated tiger cowry shells on your tired and beaten hands and feet. Once you've shown your hands and feet some love, treat them to a fab mani-pedi. Ask for a basic manicure (P70) or basic pedicure (P80)--or get both for P150. If you don't really have time to get the hand and foot spa prior, don't worry, because this service includes cleaning and a three-minute massage prior to polish application. You can upgrade the regular polish (P50) to imported brands like OPI, Orly (they have the latest shades, but we love the bronzy-silver Rage), Essie, and China Glaze. College chicks will have a blast choosing from their Tinkerbell Nail Art options, too, which include cute stones, stamps, and stickers. Nail Fairy has "mesmerizing massages" that will soothe you through and through after your mani-pedi sesh. If you want to try something new, we suggest you get the full-body Fairy Shells Massage (P400/hour). It uses heated tiger cowry shells in varying sizes to massage stiff areas on your body that are usually overlooked but actually contain most of the tension knots that are hardest to eliminate. It's the spa's own version of the Hot Stone Massagge (P400/hour), which is also available. This more common process uses water-heated volcanic stones to apply heat and pressure to your body, stimulating the nervous system when placed along the person's back while the therapist massages the rest of the body. You may also want to try their version of the Hawaiian Lomilomi (P400/hour), the traditional massage of Hawaii widely known for its ability to relieve negative tentions in the body using a kind of dance movement therapy--the therapist uses fluid strokes of varying rythms and intensity all over your body. To see Nail Fairy Day Spa's other services, go to the next page. Contact The Nail Fairy Day Spa to inquire about their group packages and to organize a "spa-rty" with your friends!